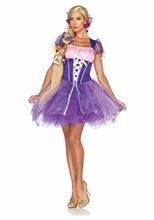 "Tangled" Princess Rapunzel Shimmer Deluxe Child Costume.Includes: Deluxe dress, petticoat and tiara. Available Size: Child - Small (4-6), Child - Medium (7-8). (See Size Chart For More Information) *Shoes Not Included. Accessories Sold Separately. 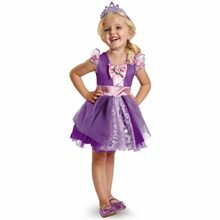 Girls will enjoying exploring their own fairytale in our deluxe shimmer version of the Disney Tangled Princess Rapunzel Toddler Costume. She is a spirited and playful Disney princess with extra long, magical hair in her newest hit Disney film Tangled. 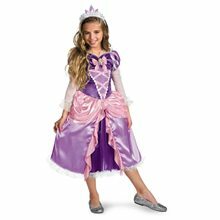 Our Deluxe Shimmer Princess Rapunzel Toddler Costume includes a deluxe purple dress with metallic pink peplum, puff shoulders, long sheer sleeves, attached white crinoline petticoat and a white tiara with faceted purple jewels. 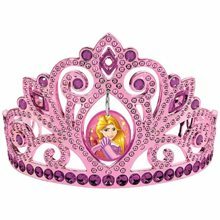 The gown bodice has a pink lace-up detail with a Rapunzel character cameo set over a metallic pink ribbon bow on the chest. 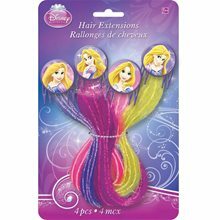 Tangled Rapunzel Child Wig.Includes: One Tangled Rapunzel Child Wig. Available Size: One Size Fits Most Children. *Costume and Accessories Not Included. Sold Separately. 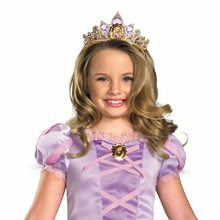 Girls can let their hair down and enjoy some dress-up play with our Disney's Tangled Rapunzel Wig. She'll enjoy pretending to have the magical long hair of the Disney princess during costume play. The Disney Tangled Rapunzel Wig features extra long, lush blonde hair with a side part. This kids' Rapunzel wig has over 2 feet of golden blonde locks to help allow girls to live their fairytale. 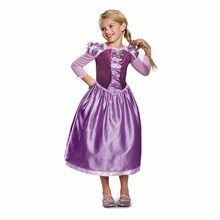 It will have your child feeling ready to adventure out of her tower to explore the world around her in our Tangled Disney Rapunzel Costume. Rapunzel Wig;Let down your golden hair to anyone you like with this 36" long braided wig. Our Rapunzel Wig is child size.